Upgrading storm from "major" to "severe"
Can't promise anything great west of University Ave.
Hunker down? Though it was blowing horizontally outside my bedroom window I refused to accept my fate. A month ago I had reserved this night to take Chup to his first ever performance of The Nutcracker. I purchased the best seats money could buy at Provo's new Performing Arts Center and circled December 2oth on my calendar. Here it was--the very date-- and the snow was blowing up and down the street looking . . . I want to say it . . . I am going to say it . . . menacing! Then there was Chup. What we thought was a fast, intestinal food poisoning stint on Tuesday turned out to be the full fledged flu (he's even had the shot). All day he seemed sufficiently well, and I had faith that his condition would allow him to enjoy The Nutcracker (for heaven's sake!) But an hour before we were to leave for the performance I found him in bed in his sweats braving the chills. "Can you find another date?" he asked in a quivering voice. I recalled that The Councilwoman had expressed an interest and so I called in an invite. She accepted. "Meet you there in a half hour!" she said cheerfully. As I got ready for the night I watched for changing conditions in Andrew's storm. He was right, I should be hunkering down. The lyrics "Oh the weather outside is frightful" kept creeping into my head forcing me to forcefully belt out "LET IT SNOW! LET IT SNOW! LET IT SNOW!" Though I didn't want it to snow so much that it would ruin my evening. When I arrived at the Center I shared a parking lane with some of the members in the orchestra. They hurried out of their car--violins in hand--and slid away to the back door. Inside people in puffy coats were packed into the foyers, all doors to the theater were closed and the whole place was strangely dimly lit. There were raffles going on, and an art gallery full of kids, as well as someone playing soft Christmas tunes on the piano on the second floor. It was all very "Where's Waldo?" except I was looking for The Councilwoman. "It is a shame isn't?" said a woman with silver hair and an Irish accent as we looked for an open space to stand amongst the crowd. "Oh yes." I responded confidently though I wasn't really sure what was the shame. Was it that they hadn't started seating? That the blizzard outside was unrelenting? That the teenagers already looked bored leaning up against their parents? That this whole place was so tragically dim lit? "Power outages." she said again shaking her head as if she were remembering the potato famine. Moments later the storm blew in my mother. 'Hi Honey! Wow it is dark in here." She was wearing a most lovely quilted green coat. Behind her came a mom followed by five girls--in decending height-- all wearing matching red velvet dresses with faux rabbit fur trimming. Lindon is so cute. Before I could explain the theatrics of the evening to my mother, we noticed a crowd forming in the downstairs foyer. A woman with red hair was trying to yell for attention. "Excuse me!" Crowd was still noisy. Someone whistles. "Excuse me!" The crowd quiets down. "It appears that our power is out. Crews are working on the situation as we speak but we don't have any idea when power will be restored. We are holding the dancers and orchestra until eight pm. If there is no power at that time we will be canceling the show. If you chose not to wait, you can get a refund, though not tonight because as you can see, our computers are not working either." Computers run on power? Now I knew.
. . . or not started. A Dad was yelling at his kid who was climbing the stairs backwards. A senior cit was trying to take pictures by the Christmas tree with her unobliging granddaughters. A woman with an obvious breast enhancement was talking REALLY LOUD ABOUT her daughter's dance group. And then, then The Councilwoman started waving at acquaintances, which is what you don't want. The woman is a social pinball wizard. The masses love to talk it up with my mother. "Let's go." I said. "I am going to come back later and get my refund." I was disappointed, but I knew in my heart (and uterus) that I had done the right thing. We went to my parent's house and had my dad's egg salad sandwiches on cinnamon bread and a fire in the fireplace. 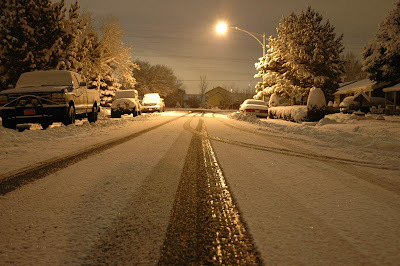 We watched it snow under the street lights until finally I remembered the line, "Oh the fire is slowly dying . . ." and I decided to head home. The snow was hitting my windshield until I crossed University Avenue. Heading west, the storm seemed to weaken. I think I even saw stars in the sky. Now that I could head home to "hunker down," per Andrew's advice, I was deeply disappointed that there was indeed nothing "great west of University Ave." Snow merely traced my front lawn . . .
. . .proving once again that my brother knows his weather.